We’d love your help. Let us know what’s wrong with this preview of Escape from Asylum by Madeleine Roux. Ricky Desmond doesn’t belong in the Brookline asylum. His parents sent him here because they think he’s a deviant—and that he can be cured—but Ricky knows there’s no cure for what he has. To ask other readers questions about Escape from Asylum, please sign up. Should I read this book BEFORE Asylum or after? So I don't tend to read prequels often. Prequels and novellas are those things that I don't feel like they add anything to the story for the most part. But I really love the Asylum trilogy and I think about it all the time so when I saw this at the library I instantly brought it home and started it immediately. I'm really glad I read this. It doesn't give too much background for the Asylum trilogy, but it does still have an interesting story, and it was interesting to see where the characters in So I don't tend to read prequels often. Prequels and novellas are those things that I don't feel like they add anything to the story for the most part. But I really love the Asylum trilogy and I think about it all the time so when I saw this at the library I instantly brought it home and started it immediately. I'm really glad I read this. It doesn't give too much background for the Asylum trilogy, but it does still have an interesting story, and it was interesting to see where the characters in the trilogy had their beginning. Do I think that this is necessary to the trilogy? No. But I still recommend it. My one issue came from the end. I felt it was very anticlimactic what happened and there was a lot of build up for a bit of a rushed and pretty boring conclusion. But I did love the scene with a father and son that clearly kicks off the trilogy and where the trilogy went so I did appreciate that. Escape del Asylum es la precuela oficial de Asylum, sin embargo, existe una precuela antes de esta precuela que se llama El Director. Se tiene que leer en definitiva el Director, antes de este libro porque trata cosas spoiler de ese y si no lo leen no entenderán. Sin embargo, este libro no me convenció tanto. Pensé que me iba a resolver muchas dudas generadas con Asylum y no me las resolvió. Pienso que aún quedó muchos cabos abiertos en donde se podía profundizar más la historia. Además, no me g Escape del Asylum es la precuela oficial de Asylum, sin embargo, existe una precuela antes de esta precuela que se llama El Director. Se tiene que leer en definitiva el Director, antes de este libro porque trata cosas spoiler de ese y si no lo leen no entenderán. Tampoco pude conectar de manera más efectiva a todos los personajes y su influencia en Asylum. No sé, a este libro, le faltó mucho. No obstante, me gustó la historia de Ricky que se desarrolla en la trama del libro y su relación con los otros pacientes del Asilo y su relación con el director. Y cómo el director afectó a Ricky de maneras inimaginables. If you're interested in reading the Asylum series, I recommend starting with this book since this is a prequel that takes place in the 60's. We follow Ricky Desmond as he's wrongfully sent to a lunatic asylum that's run by a ruthless warden. As he tries to escape, he sees strange things that question his sanity. If you want a nice creepy read, then check this out. As the teaser said this book can be read both as a stand alone and as a prequel to the series that shines more light on what happened in the old asylum. I think that the beginning of this book had more horror than the original series and this book had more of a creepy asylum vibe I liked. Although I loved Dan, Abby and Jordan but Ricky was also a likable character. Escape from Asylum is a prequel to the Asylum series which story circulated around Ricky Desmond, a teenage guy with a temper management issue. He is living with his mother and stepfather and has visited several institutions for his issue. But on the day he became violent towards his stepfather, Ricky has no other choice but to live in Brookline, an asylum headed by Warden Crawford. The book, I admit, is way better and creepier and scarier than the other Asylum books bearing in mind that this is actually is a prequel. I loved the way Madeleine Roux slowly unfolds the mysteries and the connections it has with the Asylum series. I loved how it made my heart beat faster with every scene and how it made me had a mini heart attact with a scary scene followed by a scarier picture. I actually love Escape in Asylum and the characters, too! But I got confused with Kit. She was addressed by Ricky as a girl but the pronoun used by the nurses in addressing Kit was 'he'. So I was not really sure about it. And I was still confused even after reading the last page of the book. But other than that, I loved it! +Hell yeah!!! As you noticed, I finally gave 5 stars for this one. +Why??? It doesn't mean that I LOVE THE ENDING. But the story, omg.. It makes me alive. +What I mean, the Escape from Asylum is way way better than the 3 extra novellas that I've read. Sanctum is a little bit boring same as Catacomb. BUT this book! Woahh..
+Still give me the creeps. +The writer finally made me shiver at 3 in the morning! & I was looking behind my back now and then! Seriously! I was imagining that I'm Ricky. Being in that creepy asylum in Brookline! Gah!!! +Oh I love Kay and Nurse Ash. The characters here are quite interesting. Even the warden itself. Daniel Crawford. +Despite of liking or loving this last book of Asylum series, there's still TONS OF QUESTIONS roaming in my head. Really. TONS. +What happened?! With DAN'S story? Will her mother be okay? Where the is heck is he? What happened?! How Kay survive in the asylum without Ricky's help??? How was the Asylum after everything happened? Where is the warden? How did the story goes?! +A lot more.. Sorry for giving you SPOILERS but I warned you right?! LOL. +Madeleine Roux you are awesome! Really! You should update us soon! I'll be waiting for THE HOUSE OF FURIES! Oh please tell me what happened after BROOKLINE! +I learned to love those characters! I need an answer! +All in all, I admit, I love the series. Despite of holes, too many plot twist. The storyline was good enough to make you feel miserable and frustrated. The strategy??? For wanting more from this story is quite strong. +I couldn't put up enough RIGHT words for all of my reviews now a days. Work schedule is the true reason. +It was like all ramblings and rantings only. I just made reviews straight to the point. Sometimes words cannot express what we really feels, or should I say most of the time? +I cannot explain. But it happens. Right? I'll stop being so dramatic & all, just want to acknowledge it. +What I also learned about the story is being strong enough. I mean trusting your SELF. Sometimes you cannot trust anybody. Even your friends will leave you. Better to trust strangers. SOMETIMES. +DON'T FORGET YOUR PAST. What I mean is, remembering those good and bad memories will help you remember who you are. +MOST OF ALL, LOYALTY. Why? It's for you to find out. How? READ THE SERIES. NOW. +Thanks again for replying in my messages Miss Roux. :) I'll be waiting for the NEXT world you'll build. AGAIN, read it in RIGHT ORDER. DNF. Really tried but never caught my attention. Total bummer because I really liked the main series. This prequel to the Asylum series continues the story of Brookline Asylum by taking us back to the 1960's and answering some of the questions raised in the other books. While I didn't find the story as strong as the first Asylum book, Escape from Asylum still kept me riveted. Like the previous books in the series, the creepy ghosts, brainwashing and horrific treatment of patients made my skin crawl at times. It conveyed a sense of claustrophobia, of being trapped and helpless. I became wrapped up in the lives of the characters, truly worried about whether they would escape intact, mentally and physically. I was cheering for them to escape. This review has been hidden because it contains spoilers. To view it, click here. I really liked this book, and I almost liked these characters better than I liked Dan/Abby/Jordan. I wish it wasn't so short, I feel like it could of used a book two instead of that sort of rushed ending. I wished we would of found out more of what happened to other characters in the end, like Patty and why he didn't see Kay for what, a year? And also I wished we would of found out more of what the White Mountains were/meant. Really enjoyed this book though. This is a story about Ricky. He's a teenager. He likes men and women and he has a bit of a temper. Which is why his mom and his step-dad Butch has admitted him to Brookline and Warden Crawford care. At first it isn't to bad. He makes a friend, Kay. She a beautiful dark skinned lady. She's been admitted to Brookline because she was born Keith and her dad couldn't have that. He throws on the charm and humor working to get that phone call home cause he knows once he talks to his mom she will come This is a story about Ricky. He's a teenager. He likes men and women and he has a bit of a temper. Which is why his mom and his step-dad Butch has admitted him to Brookline and Warden Crawford care. At first it isn't to bad. He makes a friend, Kay. She a beautiful dark skinned lady. She's been admitted to Brookline because she was born Keith and her dad couldn't have that. He throws on the charm and humor working to get that phone call home cause he knows once he talks to his mom she will come running back to get him. It doesn't take long for Ricky to realize his mom isn't coming and he isn't getting a phone call. The Warden has tooken a special interest in him and according to Kay that is very bad. Between the Warden, and him hallucinating people, things are getting very weird. Then his nurse, Nurse Ash, begins acting odd. One minute she is telling him not to trust the warden and the next she's calling him delusional, and in the end he knows he needs to get out of Brookline. So this was a pretty good book. It was set back in time when the asylum was open and the Warden Daniel Crawford ran it. Although I didn't catch the exact time. (If it ever said it at all) There where appearances from those known from the previous 3 books, and as always great spooky pictures. Its a bit creepy but I scare real easy and it only creeped me out a little at night after everyone else was asleep. I found Ricky to be a familiar character because it seemed like he was a little bit of all 3 characters from the previous books. He was outspoken and into guys like Jordan, fiercely loyal to his new friends like Abby, and way to curious for his own good like Dan. I don't know if it was meant to be that way or even if its good or bad. It did have me biting the nails at time worried about what happens next. There was a lot about this book that reminded me of season 2 of American Horror Story, but that could just be coincidence. Todo brilla en los pasillos superiores, todo luce tranquilo y los problemas parecen no existir allí adentro, pero ese lugar esconde sus mayores secretos detrás de las sombras, en los pisos desconocidos y en sus pacientes. No puedo decir que me encantó, no fue el mejor libro de la saga (y creo que fue un poco innecesario), sin embargo, hay algo que siempre me mantuvo pegada a cada página que aparecía por delante, las descripciones e imágenes siempre logran traer un buen ambiente. El libro en sí t Todo brilla en los pasillos superiores, todo luce tranquilo y los problemas parecen no existir allí adentro, pero ese lugar esconde sus mayores secretos detrás de las sombras, en los pisos desconocidos y en sus pacientes. No puedo decir que me encantó, no fue el mejor libro de la saga (y creo que fue un poco innecesario), sin embargo, hay algo que siempre me mantuvo pegada a cada página que aparecía por delante, las descripciones e imágenes siempre logran traer un buen ambiente. El libro en sí tiene un ritmo un poco lento para mi gusto, la trama transcurre dentro de las paredes del manicomio y sus alrededores, y sus personajes, muchas veces, no conocen más que esas paredes, esperando una libertad que muchas veces solo queda en las palabras. Dentro de esta precuela, seguimos la historia de Ricky, cuando lo internan, su tratamiento y lo que pasa después, pero en realidad no pasa mucho; sí vemos escenas fuertes y la realidad de los pacientes dentro de ese horrible lugar, pero no logró convencerme. Los nuevos personajes me gustaron, el desarrollo de personajes anteriores fue interesante y me gustó. Y el final, no sé, fue demasiado apresurado y poco creíble, no me gustó, no era un final para una novela así. I don’t know why I keep hoping for something more from these books. This prequel is arguably better than the whole series with the exception of the first book simply because the scary moments WERE actually kind of creepy. The dream Ricky had about his mother like a doll and his stepfather all creaky and bent out of shape was the first time this author has given me the chills. The breadth of characters was refreshing too, especially since it’s the late 1960s. It was considered deviant to be anyth I don’t know why I keep hoping for something more from these books. This prequel is arguably better than the whole series with the exception of the first book simply because the scary moments WERE actually kind of creepy. The dream Ricky had about his mother like a doll and his stepfather all creaky and bent out of shape was the first time this author has given me the chills. The breadth of characters was refreshing too, especially since it’s the late 1960s. It was considered deviant to be anything but heterosexual, and so Ricky and Kay found themselves at an asylum. Sad, that. I actually liked this a fair amount more than Asylum itself. It helped renew my desire to continue (which had dwindled after the first book). The haunting aspects vs reality are a strange mix. I actually liked both Ricky and Kay. I kept expecting trouble with Dennis, having read the first book. There are some odd mind games in this book that make you feel almost as lost as Ricky must have felt which was good. Still this is a very mild YA horror novel. Part supernatural, part psychological. I definitely thought the ending to this book would be a bit more dramatic than it actually was. Not that there wasn’t drama but it ended a bit more abruptly than I expected. To see a full review check it out here. The book was spooky and captivated my attention a lot more than I thought it would be able to. It has been so long since any horror novel or movie has scared me, but this one had my heart racing at some points. Well done. Là tiền truyện của Asylum nhưng được viết sau và lời khuyên chân thành là cũng nên đọc quyển này sau Asylum. Cốt truyện bổ sung vào Asylum rất hoàn hảo và hoàn toàn logic. Tình tiết gay cấn, nhiều kiến thức mới lạ về các thí nghiệm trên bệnh nhân tâm thần ngày xưa xen lẫn với yếu tố rùng rợn. Trừ 1 sao cho cái kết khá hụt hẫng. Tóm lại đây vẫn là 1 quyển rất đáng đọc cho những ai thích dòng truyện kinh dị, có thể đọc sau Asylum, hoặc đọc một quyển này thôi mạch truyện cũng vẫn tốt. 5 cups of tea read. Was any interesting novel and the setting was creepy. (view spoiler)[ the warden was a creepy, violent man. how many patients needed to die before he stopped what he was doing? qoute from the book "To be patient zero meant losing himself, not to death, but to something much worse" That sums up what happens in this novel. Ricky is bought to the asylum after a fight with his stepdad but being in places like this was nothing new to Ricky he had a temper that got him in trouble. I 5 cups of tea read. Was any interesting novel and the setting was creepy. I wanted to like this book as much as I liked the other books in the series...however it was a struggle for me to read. I had a hard time connecting with the characters and felt a sense of one dimensional development. I'm not sure why I was not pulled into the twisted, creepy, and brutal halls of the asylum like I was in the other books...sigh. This YA story was better than I thought. There were good parts and bad. I will be reading the other three in this series because my reading instinct has been peeked. uf! lo amé ♥ Me duele despedirme de esta saga. aún no sé si 4 o 4.5 pero me encantó este libro. I felt unimpressed. I wanted more of an asylum feel, if that makes sense? I wanted more on the procedures and more atmosphere to really make me feel like I was there. I also didn't feel like I was in the timeline. There was nothing really there to make me feel like I was in the 60's. I also would have liked more info on Lucy and maybe some more background on the other characters. That would have drew me in way more. I kept wondering about Lucy and certain things that happened made me confused be I felt unimpressed. I wanted more of an asylum feel, if that makes sense? I wanted more on the procedures and more atmosphere to really make me feel like I was there. I also didn't feel like I was in the timeline. There was nothing really there to make me feel like I was in the 60's. I really enjoyed getting to read this prequel as it explained a lot about some of the characters in the first in the series. Another terrifying insight into the mental institutions that were run until not that long ago. This fictional tale was interesting and looking forward to reading the rest of the series. Aunque se supone que Escape del Asylum es una precuela, personalmente recomiendo leerla después del resto de los libros que componen la saga para no recibir spoilers. Entonces, el orden de publicación es el mejor, especialmente si lees todo de un tirón, ya que así no te perderás ningún detalle. Ricky acaba de ser ingresado al hospital psiquiátrico que está bajo las órdenes del director Crawford. La enfermera Ash lo vigilará constantemente. Hacer amigos entre los pacientes es muy difícil, pero una jovencita que parece estar cuerda lo ayudará a aclimatarse. Pero, nuestro héroe confía en no quedarse mucho tiempo, ya que él no es como el resto... ¿Verdad? La narración logró cautivarme una vez más. El escenario y la atmósfera son tan espeluznantes que atraviesan las páginas. Realmente no me gustaría estar en ese lugar ni de visita. El terror psicológico, un poco paranormal, que nos prepara la autora nos inunda en las pocas páginas del inicio. Con un ritmo rápido y muchas sorpresas en el camino, la lectura es muy entretenida y... para leer con la luz encendida. La preciosa edición mantiene las solapas, los detalles internos, las páginas ilustradas y las fotografías de espanto. Ricky es un protagonista con un poco más de chispa que Dan, lo cual se aprecia, pero no logró cautivarme al completo. Algunas cosas que escondía y que a lo largo de la lectura van surgiendo, hicieron que me simpatizara más. En cambio, la amiga y compañera de tortura, Kay, es genial. Algo muy jugado que ingresa la autora y que toma el relieve suficientemente profundo como para que cause impacto, pero no demasiado como para que llame la atención continuamente. Nos revelarán la filosofía del Director, su meta, con toda claridad. Sus objetivos, tan perversos y a la vez brillantes, nos dejarán muy intrigados. ¿Hasta dónde es capaz de llegar el ser humano? Algunos personajes viejos, volverán en todo su esplendor, especialmente los pacientes. Y también tendremos cierta sorpresa, ya en las últimas páginas, sobre una relación que nos tenía tan preocupados en el primer libro, Asylum. Un final un tanto decepcionante, no es que estuviera esperando sesos derramados, sangre y condenas de locura para todos... Pero, estaba esperando algo menos... ¿feliz? No creo que coincida con el modo general de la saga, aunque luego repasé algunos eventos en general que ocurren particularmente en esta novela y que atañen a los otros libros y fui comprendiendo algunas cosas. Sin embargo, no estoy del todo satisfecha con el cierre. En suma, Escape del Asylum es una precuela, pero también un gancho de oro para terminar definitivamente la saga si han seguido el orden de publicación correctamente. La pluma de Roux me ha encantado, ha logrado conservar el estilo en siete novelas del mismo espacio, lo que es todo un logro. Estoy esperando con ansías otras obras suyas, ya que esta me ha encantado. This prequel takes you back to the beginning...back to Brookline 1968. We get to meet many of the ghostly characters that are in the Asylum trilogy before they "vanished". If you have read the trilogy...you experience many "Aha!!" & "Oh Crap!" moments. Easy to follow, great to read. Totally enjoyed reading this book. Im a little Sad this story is over! It was good but nothing extraordinary! The plot was a little weak from time to time, but i love the writing and the place! It was creepy and awful (as it should be in an asylum from the past) and thrilling and i mean it all in a good way! People should definitely read this serie! Love it! I love this series. This is a great addition to the story & provides good background if you've read the other books. The only thing I wish is that there was a little more info on Kay at the end. I liked the ending, but a few more specifics on the how's & such with her would've been nice. Not sure how I really felt about this book. It ties the facility to the Asylum series and identifies a few characters, but it is its own separate read. I will say that it did have me looking forward to each new chapter as it has an interesting storyline. It is narrated by a different narrator which always throws me off but I should have expected. Interesting book. Still have some unanswered questions about the Warden and what the hell was really going on in the asylum. Ricky was a easy narrator to understand, but I was super confused about how old he was since they claimed he liked "younger" boys. I devoured this first book in the Asylum series in one day! Thank you to my lovely daughter, Andrea, who bought this series for me as a Christmas present. This book fills in a few blanks in the series, but like the others, since it is told from the viewpoint of characters who aren't sure what's real and what's not, the reader also is left wondering, "What just happened here?" Yet the story is compelling and the book is a quick read, especially given that there are creepy asylum photos scattered throughout. A fun quick read, this prequel to the Asylum series was just what I hoped it would be. This entire series is great if you like YA horror that is a fast read and enhanced with pictures. Escape From Asylum is the prequel to the Asylum series which I thought were all fantastic. This book gives good insight to what Brookline was like in the late 1960's when it was still a functional asylum with one really creepy warden. I found the start quite slow & hard to get into, although I was loving the characters. Nurse Ash was a fantastic nurse & even though Ricky & Kay were the main patients the story focused on, the other patients had such character. If u haven't read the As Escape From Asylum is the prequel to the Asylum series which I thought were all fantastic. This book gives good insight to what Brookline was like in the late 1960's when it was still a functional asylum with one really creepy warden. 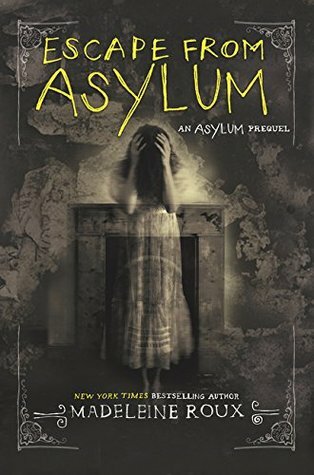 If u haven't read the Asylum books u could start with the prequel although I thought the prequel is a good stand alone story in it's own right. May be better than the original three... I definitely cared about the characters more.